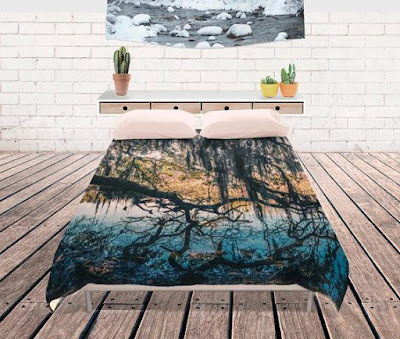 Why have a boring duvet cover when you can have a cool, clever, and stylish duvet cover that is sure to turn into a focal point of your bedroom. If you thought duvet covers aren't important, then perhaps its time to change that notion. And we are sure that once you check out these cool duvet covers we have for you, you are sure to change not only your notion but also your boring duvet covers too. 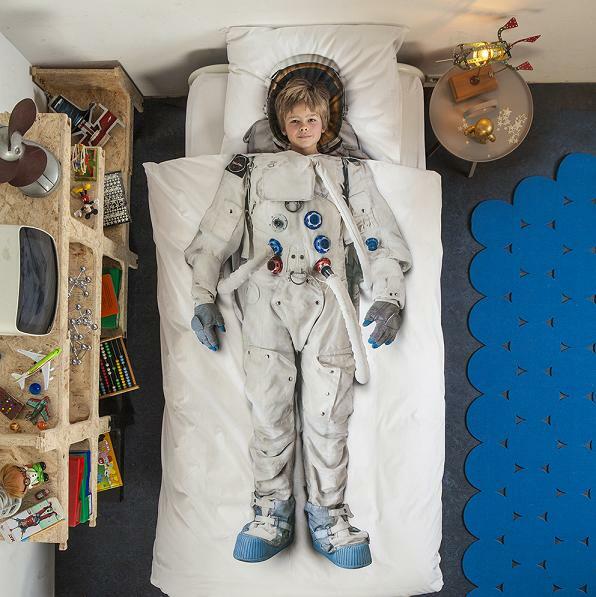 Astronaut Duvet Set: During your childhood you must have dreamt of becoming an astronaut or least know someone who wanted to become one. The Astronaut Duvet Set creates an illusion as if your kid is wearing an astronaut suit when sleeping. 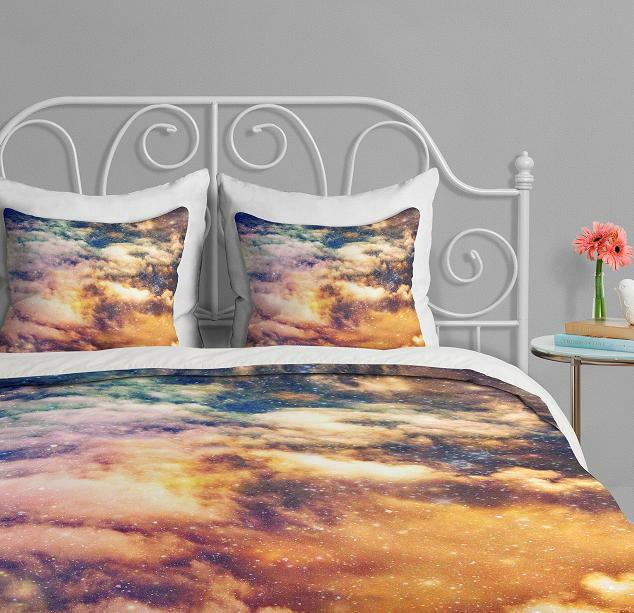 It comes with realistic astronaut photographic print; the set consists of a single duvet cover and a pillowcase. Perfect for motivating kids to know about space. Buy Now. Sailor Duvet Set: The Sailor Duvet Set creates an illusion as if your kid is dressed up as a sailor when sleeping. 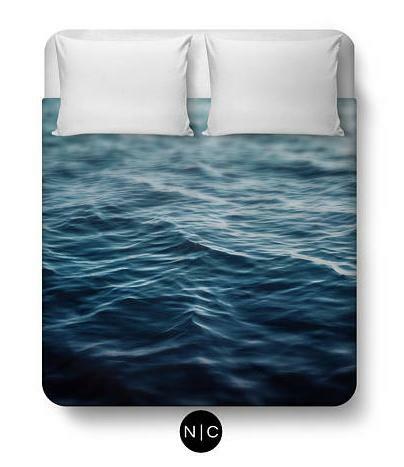 It comes with realistic sailor photographic print; the set consists of a single duvet cover and a pillowcase. It's sure to keep your kid entertained while taking them on an adventurous journey once they are asleep. Buy Now. Campervan Duvet and Pillow Case Set: Recently we did a post on campervans and mostly it was liked by you people, but much appreciation came from Instagram, they really liked it. 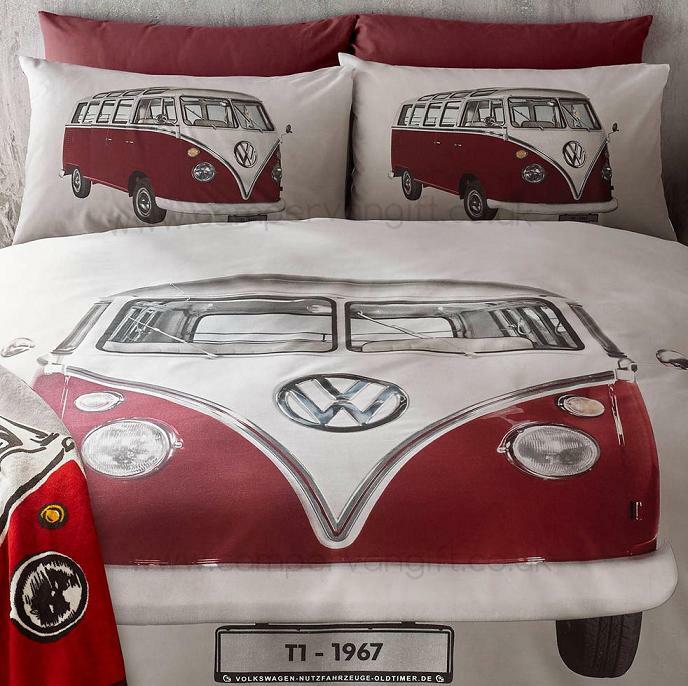 With this cool Campervan On Tour Duvet and Pillow Case Set, you get a campervan pillow to rest your head and a cool campervan duvet to snuggle under. The duvet set is perfect for king size bed and consists for king size duvet cover with two pillowcases. Buy Now. Ballerina Duvet Set: Don't you think small kids dressed up for ballet and performing beautifully on the stage looks cute? How about making your little princess dressed up as a ballerina? Thought not literally, this cute Ballerina Duvet Set creates an illusion as if your kid is dressed up for a dance performance when sleeping. It comes with realistic ballerina photographic print; the set consists of a single duvet cover and a pillowcase. Buy Now. Soccer Champ Duvet Cover: If you had played any sport during your growing up days, or had the leisure to continue it, then you understand the importance of sports in your life. 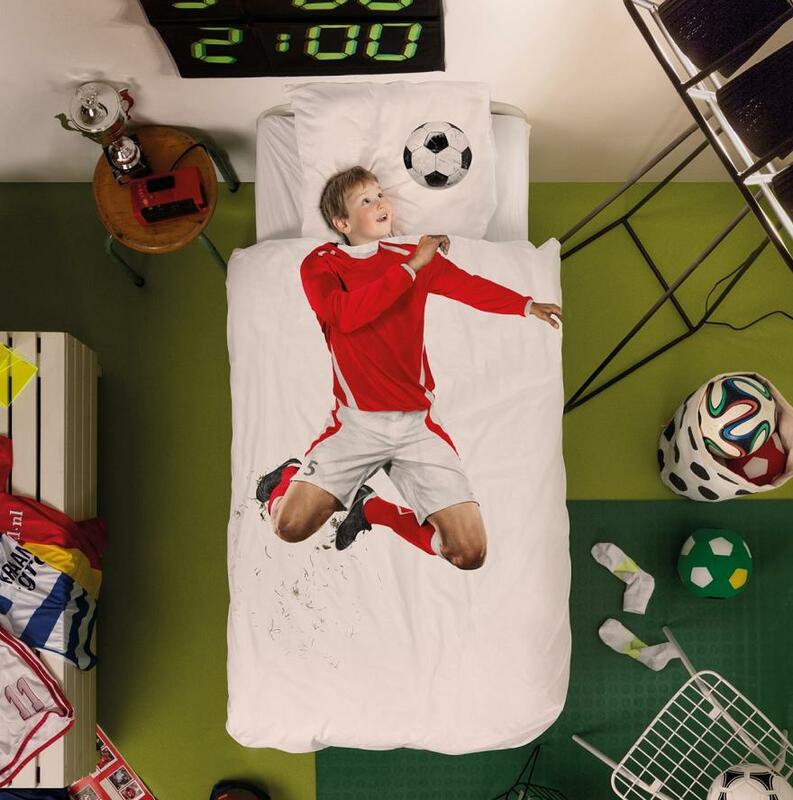 This cool Soccer Champ Duvet Cover features a realistic photograph print of a soccer player, a soccer ball on the pillow cover; and when you kid places his head on the pillowcase it creates an illusion as if a talented soccer player is ready to score. Well how do you want to use this cool duvet is your call; use it to motivate your kids, for fun or however you want, after all sports are sports. Though we are sure it's going to keep you kid entertained while taking them on an adventurous sports journey once they are asleep. Buy Now. Doodle Cotton Duvet Cover : Kids really enjoy doodling, whether its walls, tables or any other surface. Some say, when you can't stop them, then join them, what do you think of it? No? Well how about giving them a cool comforter that they can doodle on, write, or do whatever they want; and once they are tired and done, they can snuggle under it. And once its draw area is filled up, you can wash it off and it's a clean slate again. It comes with dual area to write on both sides, and ten different doodle color markers. These are wash out fabric markers so you can keep writing, scribbling, drawing, and more. On second thought, even you can use it to write a message, draft a letter or write a poem for someone you care for. Buy Now. 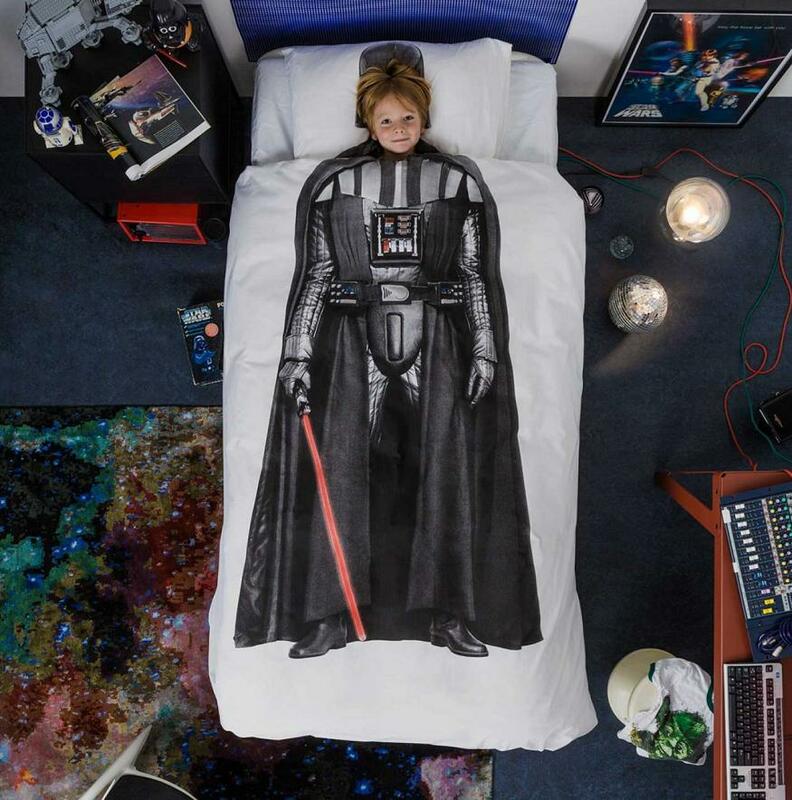 Starwars Duvet Cover: Starwars has always got everyone's attention, and from its first movie way back in 1977, to its most recent one in 2015, we have always enjoyed every bit of it. And whether you are a believer of the "light side" of the Force, or the "dark side", its your personal choice. 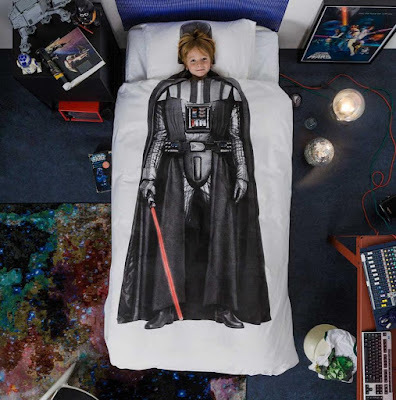 But for sure this cute duvet cover, that features a realistic photograph print, is sure to make you feel the power of the 'dark side", though not literary. And just one other small thing, though kids are really going to enjoy getting under this comforter, but there isn't any rule that says grown ups cant get under it. Just a thought. Buy Now. Princess Duvet Set: Why is that it has always been the girls who have been dad's princess, never heard of dads prince, did you? Well this cute Princess Duvet Set is here to turn your daughter into a princess, though not literally. This cute Princess Duvet Set creates an illusion as if your princess is dressed up as a real princess when sleeping. 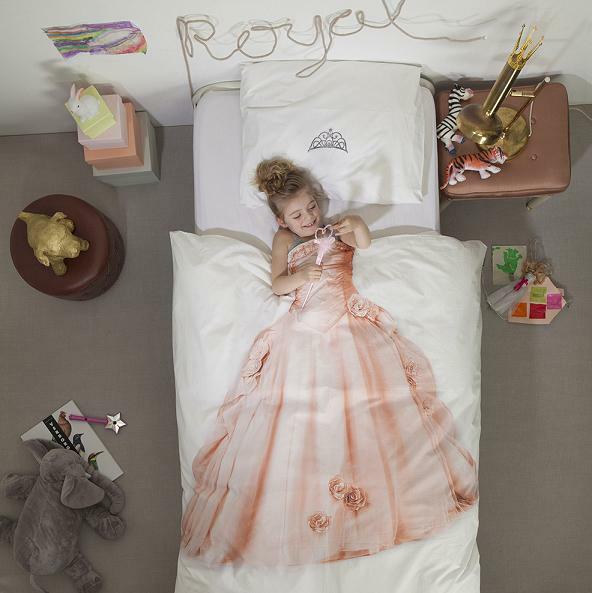 It comes with realistic princess gown photographic print; the set consists of a single duvet cover and a pillowcase. Buy Now. 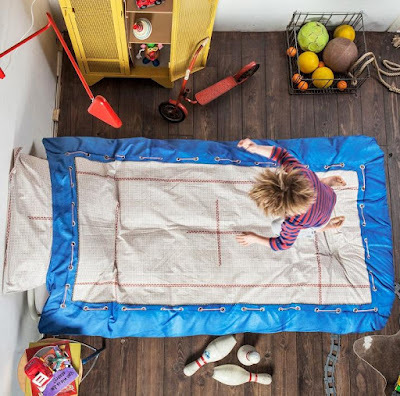 Trampoline Duvet Cover: We grownups know that bed isn't for jumping, but kids are kids and they really enjoy standing and jumping on the bed. What more, the more you ask the kids not to do, the more they try to do it, so instead of stopping them why not join them. Yes, you can use this cool Trampoline Duvet Cover to make their bed look like a trampoline. Its said you live only once, so why not let that be a happy living, after all jumping on the bed is a trivial matter, and is much more important that your kid, isn't it? Buy Now. 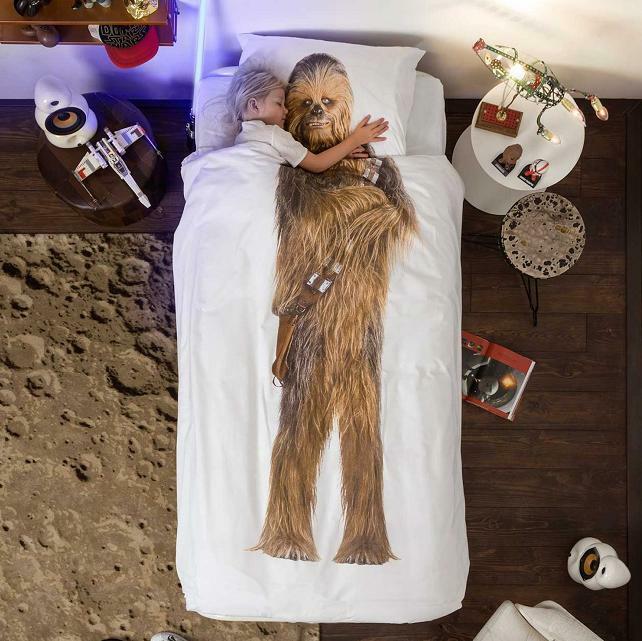 Chewbacca Duvet Cover: Chewbacca, known affectionately as Chewie, has played many roles and one of those is as a co-pilot of Captain Han Solo aboard the Millennium Falcon. Chewie has always been a dependable friend, and now he is here to keep your kid company. This cool comforter features a realistic Chewie photographic print and he is sure to keep an eye on your kid once they are asleep. Buy Now. 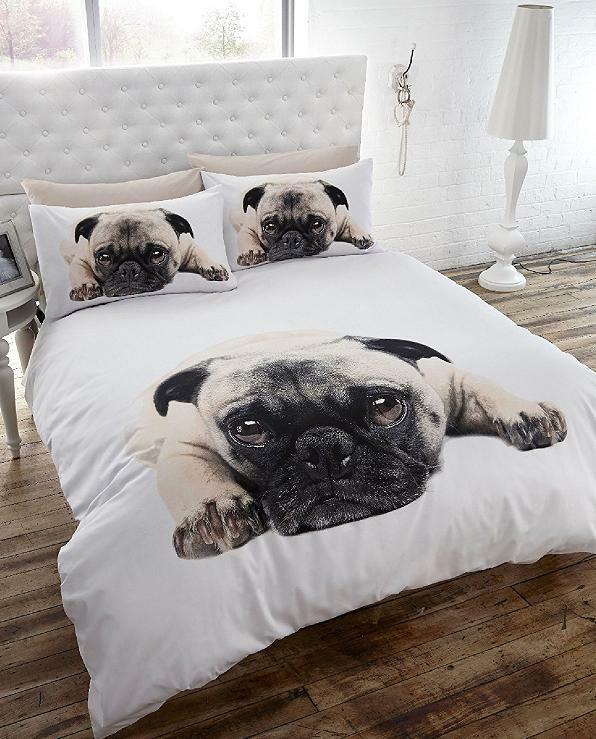 Pug Duvet Cover: Its said we can divide people as cat or dog people, and if you ever had a dog or dogs and really enjoyed their company, then there isn't much we need to talk about this cute duvet cover. On the second thought, it's a cotton king size duvet cover, features a beautiful, photographic print of a cute pug dog on simple white background, set consists of duvet cover and pillowcase set. Buy Now. 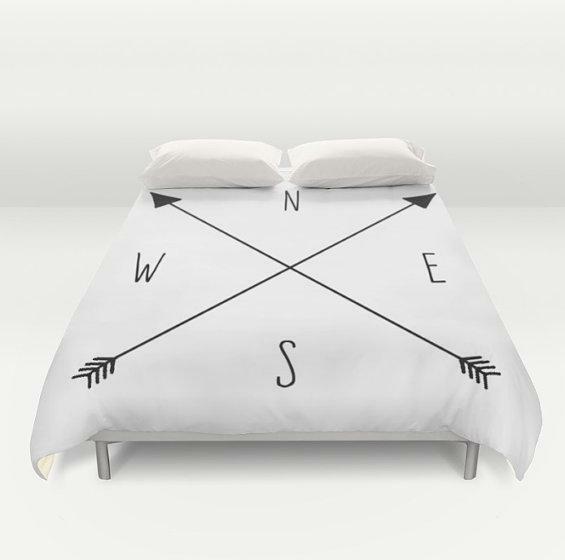 Compass Duvet Cover: If you are among those selected few who prefer a particular direction facing while sitting, sleeping and more, this cool Compass Duvet Cover is best suited for you. 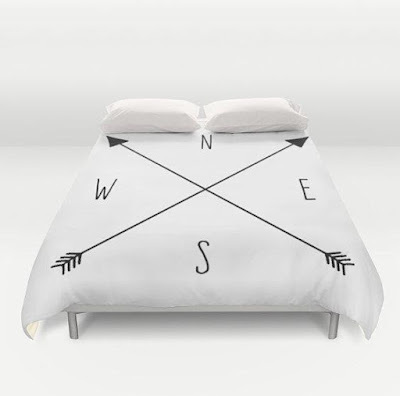 Use a regular compass to know the directions in your home and then arrange this cool duvet cover to point to those directions. On the second thought, it goes good even with nautical themed room. What do you think? Buy Now. 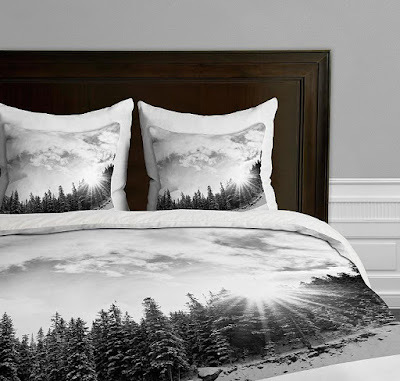 White Mountain Duvet Cover: How about getting the beauty of mountains right in your bedroom? This cool White Mountain Duvet Cover features printed mountain on the comforter, comes with a hidden zipper with interior corner ties to secure it. Buy Now. Dark Waters Duvet Cover: The Dark Waters Duvet Cover features a gorgeous seascape of deep ocean blue dark waters throughout, its rich in a blue ombre patterned style hue, and this coastal ocean style bedding cover is perfect for adding a touch of coastal living to your bedroom interiors. Buy Now. Octopus Duvet Cover: Have you ever eaten an octopus, no way we aren't talking about eating a live octopus; we aren't the strong ones to do it. How about you? 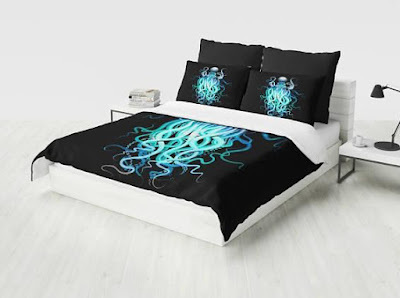 This cool duvet cover comes with blue octopus on black background that you can snuggle under and sleep. On the second thought, don't know how it feels sleeping wrapped by octopus, just kidding, it's sure to make a great addition in nautical themed home. Buy Now. 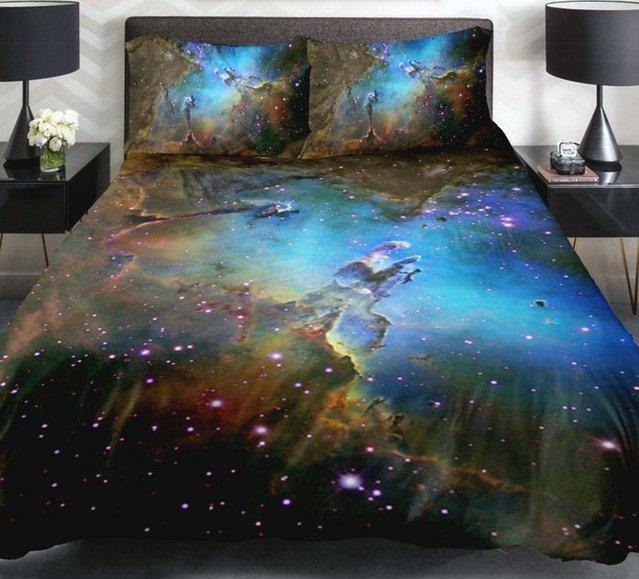 Cosmic Duvet Cover: The Cosmic Duvet Cover gets the cosmos right into your bedroom, and what more when the cosmos is covering you, you don't need to worry about a thing. Just a thought. Buy Now. Tree Duvet Cover: The Georgia Tree Branches duvet cover gives a perfect way to get nature right into your bedroom. And wont it be wonderful to be covered by tree leaves while sleeping, though not literarily. But still it's going to make you feel good for sure. Buy Now. 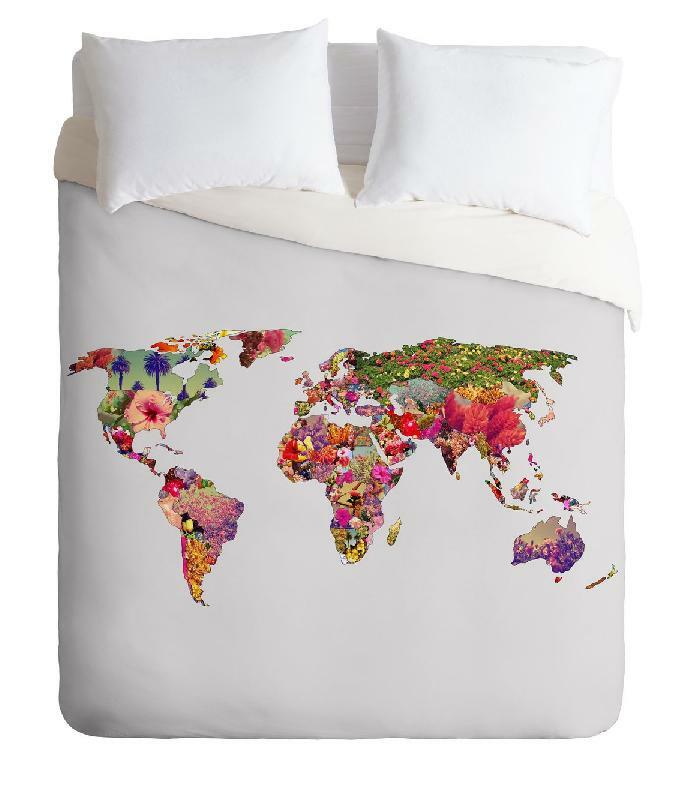 It's Your World Duvet Cover: How about having the whole world to cover you; well this is what you get with "It's Your World Duvet Cover", though not literarily. This cool comforter has a world map on a simple white background for you to snuggle under. Buy Now. Take Me There Duvet Cover: Are you among those who like being near water, or least given a chance like to be on beach? Well we aren't rich enough to have a vacation home near the seaside, but still it doesn't mean that we aren't supposed to enjoy the nature's beauty. 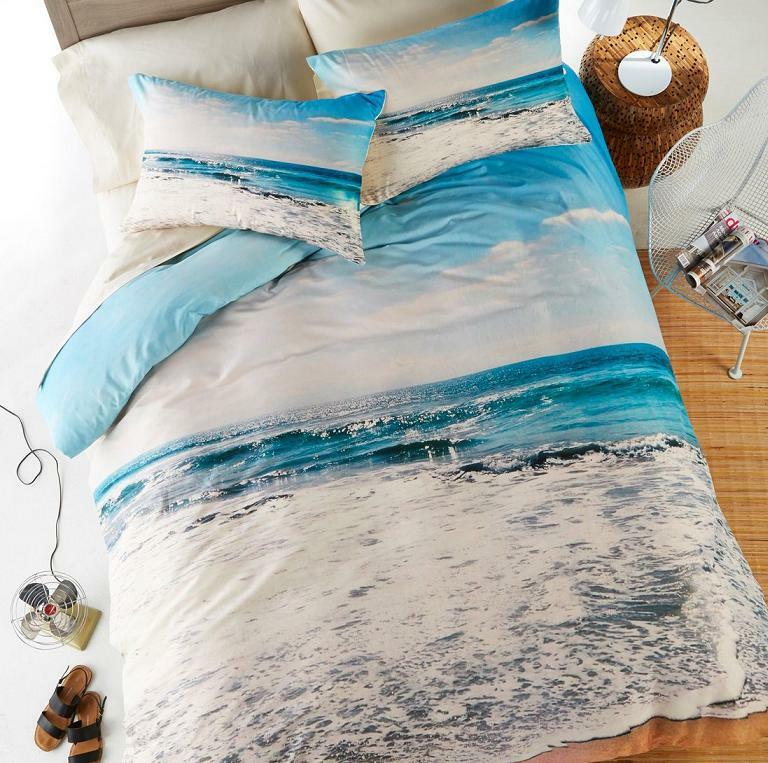 The Take Me There Duvet Cover gives you blue water with foaming waves right in your bedroom. A cool duvet to wrap around, enjoy oceanic scenery, fall asleep or make plans for your next vacation near water. Buy Now. Galaxy Duvet Cover: The Galaxy Duvet Cover gives you a perfect opportunity to wrap yourself with the galaxy. This vibrant duvet cover features detailed print and includes a duvet cover, a flat sheet and 2 pillowcases. Buy Now. 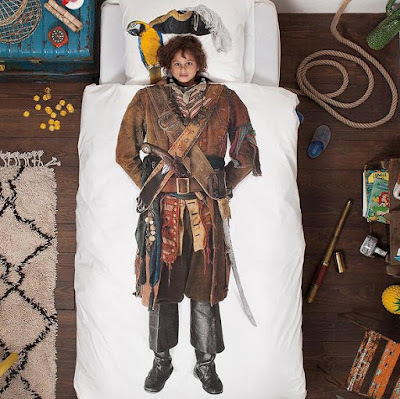 14 Awesome Bed Sheets and Unique Duvet Designs - Part 3.